Digital x-rays play an important role in preventive dentistry. Early detection helps to minimize treatment and save you money in the long-run. If left undetected, internal tooth decay, cysts, cancerous or non-cancerous tumors, impacted teeth, and misaligned emerging teeth can lead to advanced problems and surgeries. At Auburn Family Dental, Dr. Durflinger uses digital x-rays to limit radiation exposure by 1/5 of the radiation produced by traditional bite-wing x-rays and allow her to see if there are any complications only found with x-rays. An essential benefit of digital x-rays is the capability of displaying images on a large screen for the immediate observation of the images to discuss your dental health quickly and accurately. Digital images can be immediately retaken when needed. Dr. Durflinger uses the high-resolution images to highlight areas of concern while discussing treatment which gives patients the ability to make better-informed decisions regarding their oral health. This digital format can be sent and received electronically to speed-up any consultation needs with other dentists or specialists. 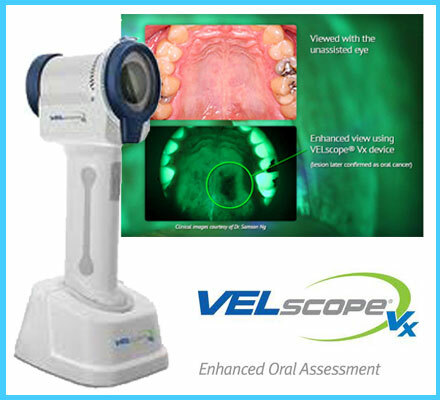 Comprehensive VelScope Oral Cancer Screening during your new patient exam and cleaning. The American Institute of Cancer recommends yearly cancer screening for all new dental patients. Included with an x-ray and cleaning, Dr. Durflinger uses the VELScope VX to screen all patients for oral cancer during their initial exam and continuing care appointments. With oral cancer rates on the rise, Dr. Durflinger is dedicated to helping patients by providing screenings for early detection of oral cancers. 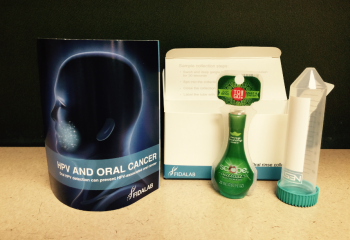 Oral cancer victims include smokers, non-smokers, or those with a family history of cancer. Because early detection increases the patient’s chances of beating the disease, Dr. Durflinger uses the device to illuminate and screens oral tissue for signs of abnormalities. Human Papillary Virus detection screenings are available at Auburn Family Dental and are not included in our new patient exam. Available upon request, we can do a simple swish and spit test to detect HPV for a minimal cost. Please ask your dental provider if you want this screening. Insurance carriers are starting to cover this procedure. 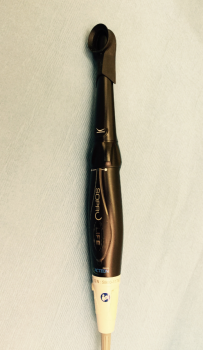 An Ultrasonic Scaler cleans plaque and calculus off teeth, aiding in the prevention of gingivitis and periodontal disease. Most cleaning appointments for adults use these ultrasonic handpieces to create microscopic bubbles that implode on the tooth’s surface, killing microbes (bacteria) while removing plaque and tartar from the area without damaging tooth enamel, including those hard-to-reach spaces. The sleek design and thin tip improve the navigation within periodontal pockets, helping to maintain optimum gingival health. Depending on a patient’s needs, the Ultrasonic Scaler can use water and/or the antimicrobial liquid chlorhexidine to clean teeth and gums. Traditional scaling methods use pressure to remove build-up whereas the Ultrasonic Scaler uses vibration, making dental cleanings faster and more comfortable, even for those patients with sensitive teeth. Hand scaling is used as a follow up to confirm that all deposits are removed, and a final enamel polish will complete your teeth cleaning. 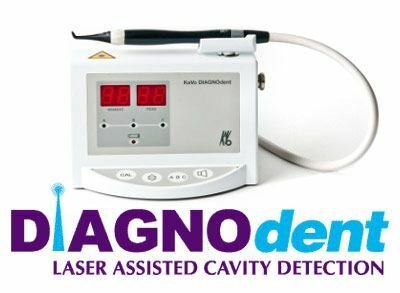 DIAGNOdent is a sleek, laser cavity detection device used to comfortably scan teeth fissures for decay. This innovative device is capable of detecting the smallest of cavities and cracks within the enamel. Early detection helps to prevent invasive procedures and minimize corrective treatment keeping the cavity preparation to a minimal size preserving the integrity of the tooth.